I bought this nail polish a couple of months ago in Boots when I was on a shopping haul spree and I fell instantly in love with it. It's such a beautiful colour (I own it in shade 430 pink punch), and its just been a great colour for my nails this summer. Its a beautiful bight fusia pink that leaves your nails in a extra glossy shine in just one coat. This Barry M glossy hi-shine gel effect nail paint provides an extra glossy finish. It's highly pigmented, chip resistant formula designed to give an extra glossy, gel-like finish with a single coat. These Barry M glossy hi-shine effect nail paint are available in an array of shades means your guaranteed all year round shine. They are named after fruit, these delicious shades look good enough to eat. Distinguishing itself from the other Barry M nail ranges, these Gelly Nail Paints come with a unique shiny silver lid. Defiantly something to check out if you love your nails! 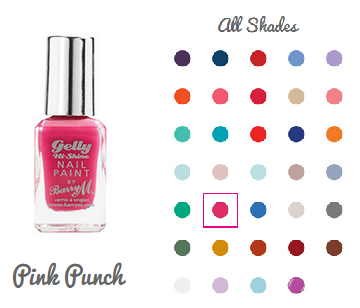 You can buy this gorgeous nail polish for £3.99 from a Barry M website by clicking here.